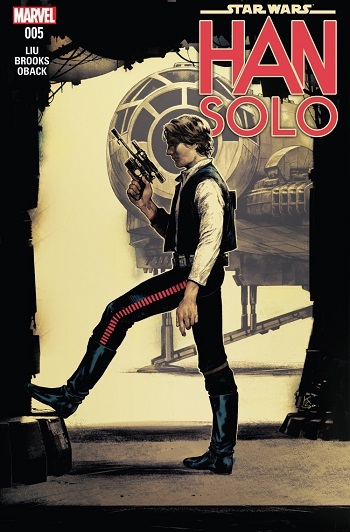 Some might find it surprising that when Marvel Comics returned to publishing Star Wars titles, the publisher did not immediately focus on Han Solo as a subject for a limited series. Han represents one of the original trilogy’s trinity, along with Luke and Leia. 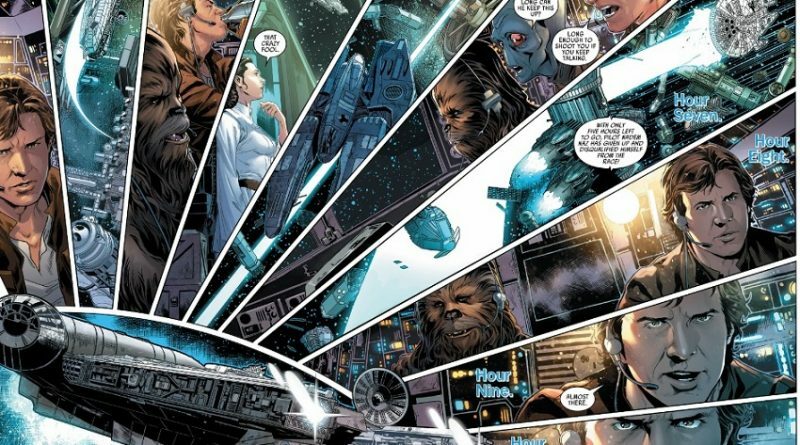 Instead, Lando Calrissian, Chewbacca, and C-3PO have all earned their own short adventures, and of the big three only Leia Organa has been provided the opportunity to headline her own comic story. The fact that Leia was among one of the first that Marvel opted to go forward with is indicative of something good that’s happening within Marvel’s Star Wars editorial team: a focus on women. Han Solo, a five issue limited series, follows through with this focus with wonderful, if not immediately obvious, decisions. The first such decision was to hand the job of writing the scoundrel’s titular debut to Marjorie Liu. 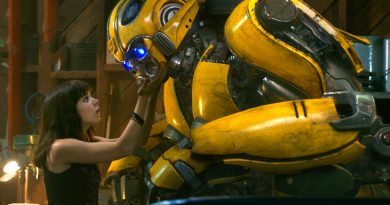 A New York Times bestselling author and a veteran comic book writer, Marvel has done something that Lucasfilm has yet to do on a cinematic level: handed the creative job to a woman. Granted, it took Marvel almost two years to do so; Liu is the first female writer to take on the Star Wars universe under its watch. (Fittingly, the second woman to be offered the chance, Kelly Thompson, penned Star Wars Annual #2, which went on sale the same day as the last Han Solo issue.) In this capacity, Liu reached into the final frame of A New Hope and pulled from it the essence of Han Solo. The Han Solo in Han Solo is a hero of the rebellion against the Empire and also a man who’s not quite sure what he’s gotten himself mixed up in – and even less sure if he wants to remain a part of it. 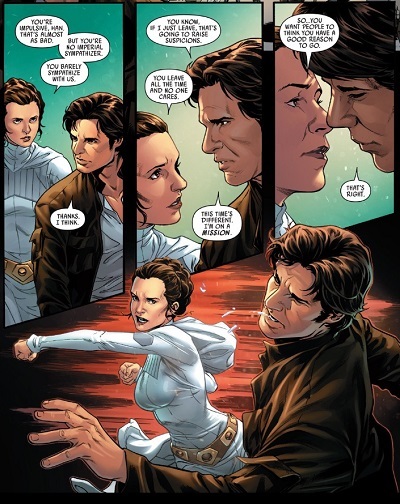 Han’s decision to accept the fate of rebel is the journey the five issues cover, while between the covers of those issues, Han sets out on Princess Leia’s behest to compete in the most dangerous race in the galaxy, the Dragon’s Void Run. Han does so as a cover to pick up rebel spies on various pit stops throughout the competition, racing other competitors but also against whomever has been sequentially knocking off members of the rebellion’s spy network. In both the competitors and in the spies, the second decision related to a focus on women quickly becomes apparent: the majority of them are female. It should be noted, however, that female aliens alone do not equate to representation of women in science fiction. The best representations are and always will be actual women. With that in mind, other than Imperial officers there are almost no other significant human characters in the story outside of Han and Leia, so one can elect to focus on the gender of the remaining major characters or not, as to one’s preference. The alien races of the characters range from the recognizable to the not-quite-familiar of the Star Wars universe, such as a pair of Twi’lek sisters, who succeed in escaping the trope of sexualization that often accompanies female Twi’leks in the franchise. More so, Han Solo establishes four pilots who represent the only true competition for the man who made the Kessel Run in less than twelve parsecs. Of that four, the gender breakdown is three female, one male (a blue-skinned alien). Turning to the rebel spies, the gender equality remains consistent with an equal representation among them. In no situation does the gender of any character influence their behavior or how others perceive them. 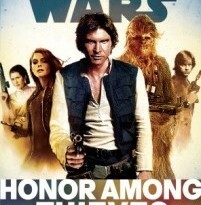 Nor does it influence their role in the story that Liu effectively lays out, with Han Solo (unsurprisingly) rising above the expectations of the professional racers by navigating the deadly obstacles of the Dragon’s Void and the murky problems associated with the world of espionage when nothing is quite what it seems. Even if it is among aliens rather than human characters, it’s refreshing to see a gender balance that indicates it’s an important factor in planning out characters. 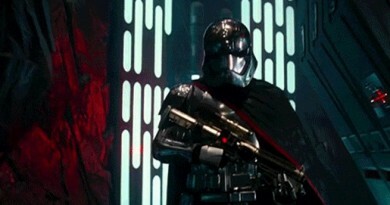 It also reflects a growing decision to consider the gender of new characters in Marvel’s Star Wars; all of the limited series have introduced more diverse casts of characters. Liu’s excellent ability to capture the character of Han Solo, as well as Chewbacca and other familiar figures, is accompanied by the superb artistry of Mark Brooks. 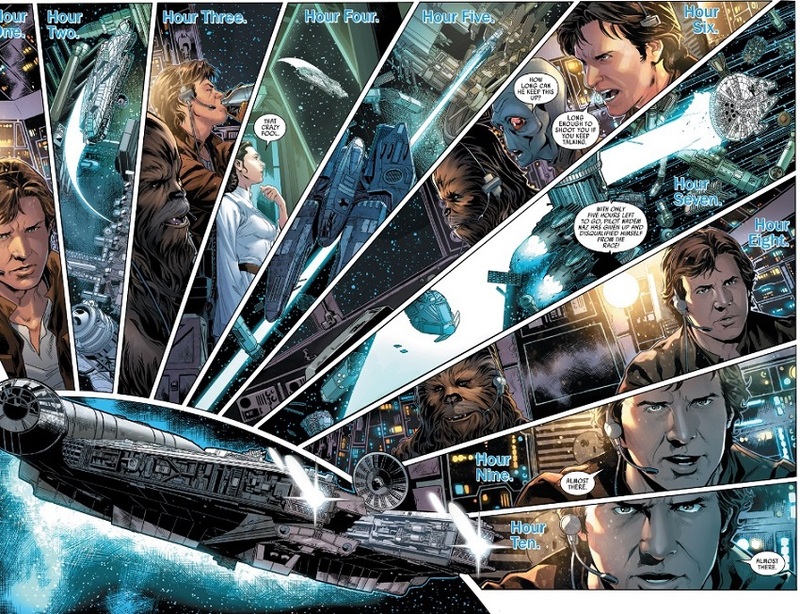 Brooks’ work on Han Solo briefly rose to newsworthy status after the publication of the first issue of the series, when it was revealed that none other than George Lucas had reached out to purchase Brooks’ original artwork. Why Lucas did so quickly becomes evident as one immerses one’s self into the drawn pages of Han Solo, in which Brooks often successfully recreates the laid back manner in which Harrison Ford portrayed the smuggler, as well catching with his pencil the delightful expressions that Ford likewise bequeathed upon the character. Additionally, Brooks creatively breaks up each page with frames designed to either quicken the pace of the moment or focus one’s eye on an important development. Through it all, a recognizable and beloved Han Solo emerges. Han Solo is beloved because of the final moment of the attack on the Death Star. His crucial return, just in time to cover Luke’s targeting of the exhaust port, not only saved the day but redeemed him as a character who wasn’t simply in it for the credits as Princess Leia scathingly remarks to Luke before the attack. Han Solo, in turn, focuses on Solo’s own internal fight over accepting whether he truly is that better person or not. When confronted with an opportunity for a glory greater than a record breaking Kessel Run, Han is forced to make that decision once and for all. Guided by Marjorie Liu’s gifted writing and Mark Brooks’ incredible art, the short five issue journey is an immensely entertaining one for readers. A single volume of the five issue Han Solo will be available in February, 2017, meanwhile, individual issues can be sought both digitally and physically available where all comic books are sold.